Stunning estate on 10 acres with views, ponds, firepits, pool table and more! Spruce Peak at Stowe is the new luxury ski resort at Stowe. Ski in-Ski out luxury accommodations, a spectacular new base lodge, fine dining, shopping, spa, a Bob Cupp designed Mountain golf club, and more! These homes are positioned at the foot of the Stowe ski resort, and allow families the ultimate convenience of ski-in/ski-out accommodations. Stowe is the perfect location for the entire family, including Fido, your canine companion! 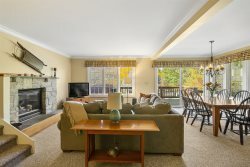 We offer a variety of luxury homes in the Stowe area including homes at Topnotch Resort! Topnotch Spa and Resort, rated among the top 10 tennis and spa resorts in the US. Indoor and outdoor heated pools, indoor and outdoor tennis facilities. These homes are located on or within walking distance of Stowes beautiful golf courses: the Stowe Country Club and the Stowe Mountain Club. These homes prefer monthly or season-long rentals during the ski season. Rates displayed do not include utilities. These homes prefer monthly or season-long rentals during the Summer. Rates displayed do not include utilities.